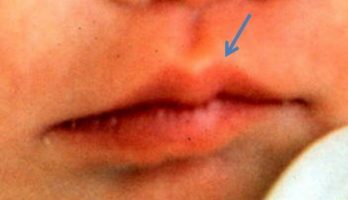 Clinicians realized that a flat upper lip lacking the bow and above the philtrum often was a signal that the mother may have damaged her baby by imbibing alcohol while pregnant. This illustration from a baby with Down syndrome is also an indication of an independent etiology from alcohol. Furthermore, it also underscores that teratogens such as alcohol have very specific impacts on the developing embryo – as specific as genomic mutations. Toxicology and toxins are not equivalent to teratology and teratogens – it is a matter of specificity of impacts. See companion Fetal Alcohol Syndrome video.